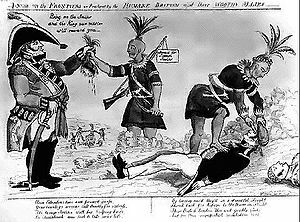 For the religious among us who choose to believe lies, the self-proclaimed experts at Wikipedia have an article very remotely related to French and Indian War. Some real Indians having a good time. Surprisingly, George Harrison is NOT in this picture. In the early years, France was continually being snubbed by the Catholic-hating British, and thus declared war on them. They had grown with knowledge, however, acquired in the Hundred Years War, and realized that No One likes to have a war in their backyard moved it over to a place where No One lives. No One did not like this very much, so after half a dozen chickens had been thrown, they moved the match over to the newly opened America. The French can never resist a fresh scalp. When the war started, the Colonies were parts of England and Canada was part of France and because they spoke different languages, they obviously hated each other. The only thing these two countries had in common was that they hated the “Indians” for taking their God-given land. The only reason the "Indians" did not join the war as their own separate faction was the Colonies' national pastime, called Scalp a Native, which the Native Americans had a monopoly on before the Colonies came about. Therefore, they sided with the French because they liked their hair, and because the French were better at lying to their face about not taking the Native American land. It was not until the Native Americans came into the war that any fighting happened; this is because the English thought that the Native Americans, not having guns, would be easier to kill. This was farther from the truth than anyone (except the redskins) expected. A typical woman waiting to be pillaged. See Scandinavia for more information. After the “Indians” took sides, the match was set. All that was left to do was to attack the Spanish, who were quickly disposed of; and then the real fighting began. In a series of major battles where the women were pillaged , the French and Indian War took its toll on the New World. ↑ When using the politically correct name, make sure to pronounce all the !s and 1s correctly. ↑ Like all good historians, I am not going to do any research on this topic and make something up that sounds good. ↑ a game still popular today! ↑ All British soldiers who accidentally shot themselves. This page was last edited on 3 September 2012, at 02:36.